We’re moving our youth venues – The Engine and The Den – into the heart of the Glade Arena this year, close the the Glade Big Top mainstage and Little Big Top. We wanted to put our youth spaces closer to the heart of the action and further away from the children’s venues. We get that when you’re a teenager you don’t want to be seen as a kid anymore! This will be a youth-only space. With no adults allowed (more on that later!). We’re working with our amazing Site Viber to create a stunning zone entrance. And we want all the young people at the festival to know they’ve got a part of it that’s well and truly theirs. We know it can be expensive to keep a young body going all hours. It needs a lot of fuel! So, this year, we’re introducing a basic and affordable cafe into The Den, our youth chillout venue. It’ll serve a small selection of hot drinks (including that festival essential, hot chocolate) and ‘things you can toast’ (think crumpets, muffins and… well, toast!). It’s a café for young people, run by young people. We’ll be keeping the new Den café / chillout venue open later each day – past when programming in The Engine has finished – so that young people can stick around in the festival village, close to the heart of the action, until later. We’re making a dedicated Youth Guide again this year so that young people at the festival can quickly and easily see exactly what’s for them. And there’s a lot! It’s not just about what’s on in the youth spaces – there are all sorts of events and opportunities across the festival that we’ve booked with young people in mind. And this handy pocket guide will be a young person’s passport to all that goodness. 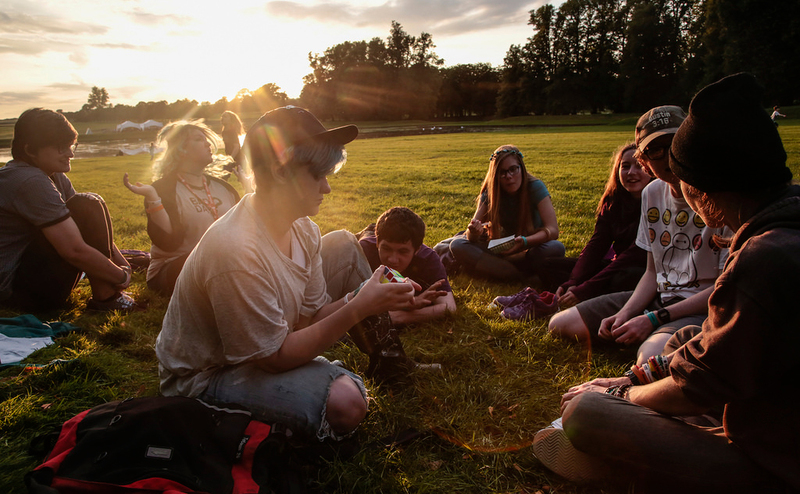 We’re working with a new team of dedicated YMCA trained youth workers this year to help us host the youth spaces, look out for young people at the festival, and run drop-in crafting and performance workshops across the day, too. They can’t wait to help us make the youth venues and spaces the place to be at Greenbelt this year. And we’re grateful to the YMCA for their support. Teamwork – it makes the dream work. There will be absolutely no adults allowed into the youth spaces and programming. OK, there will be the YMCA guys there to host and help. And there might be some adult supervision around the new café. But that’s it. If older Greenbelters – mums, dads, older brothers and sisters – like what we’ve programmed in The Engine, it’s tough. It’s not for them. This is an under-18s space only. We’ll do ID checks if we have to! Challenge 18, we’ll call it. But instead of needing proof that someone is over 18, it’ll be the opposite. We’re serious. It’s for young people only. We’ll be splitting some of the youth programme content by age. Some things will be for 11-14s. Some for 15-17s. And we’ll make this clear in the Youth Guide. Some of the sessions will be open to all, of course. But we get that when you’re 11, 17-year-olds can seem a world away. So we’re providing some space for you to experience the content alongside people more your age from time to time. We’ll be announcing more details about the youth programme over the coming weeks on our lineup pages – and in our brand new festival app. But ahead of that, here are a few things we’ve got planned, just to give you a flavour.